Christmas came early/late!? That’s how I felt when I got this set and Star-Lord at the same time. This set was long overdue because the strike at the Los Angeles and Long Beach ports, but he is finally here. I do like this set a lot, but it does have some issues. As most people have seen on the forums and other Youtube videos, the Strike suit has got some articulation issues because of the restrictive costume. 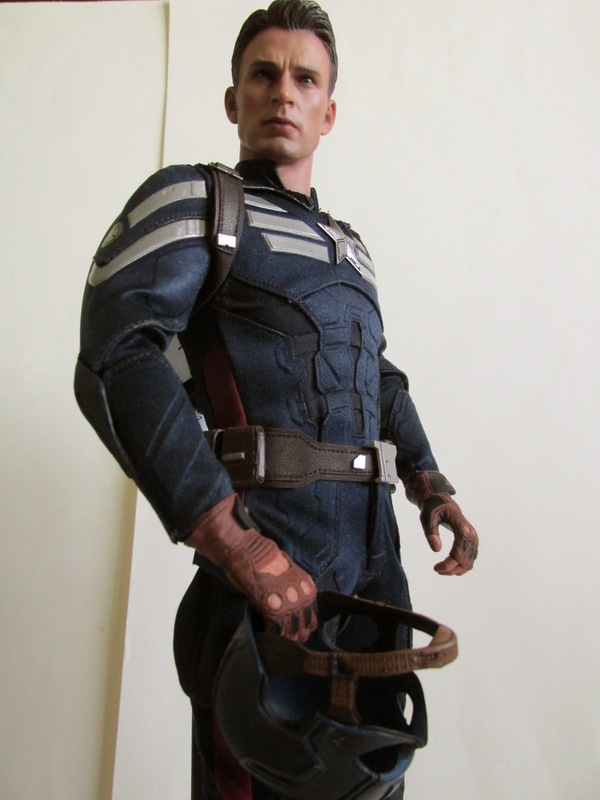 Overall, the Strike suit looks great and has all the details you would expect from Hot Toys. The suit however hinders most arm movement to an arthritis crawl. 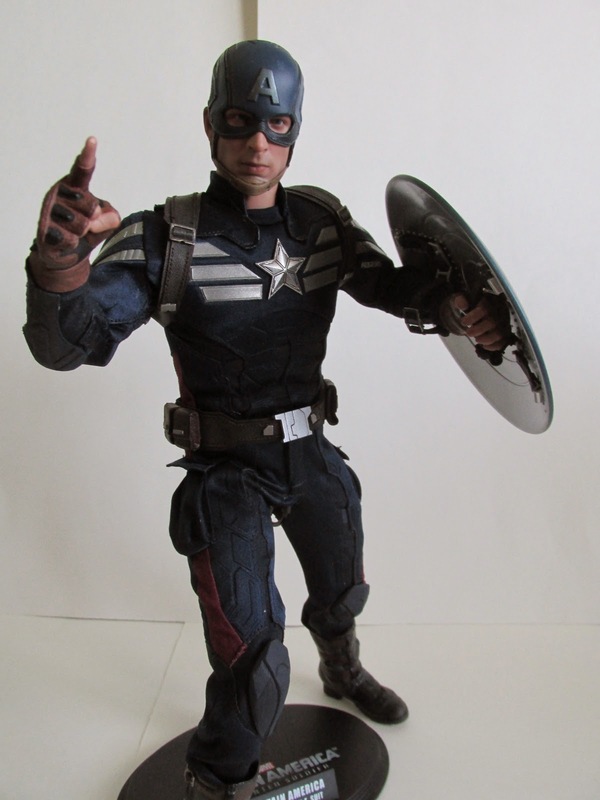 Most other Captain America figures in the past have had a hard time with this, but this time the elbows even have a hard time moving. I found though if you are firm and force the arms to move, you can get a better bend and pose with them. On the other hand, the legs have no problems with movement and can spread really far. 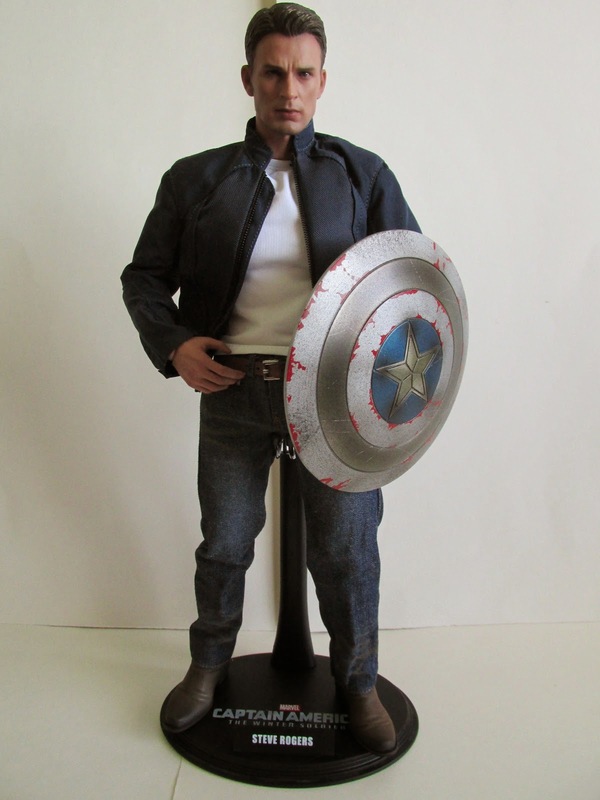 The other figure you get in this set is Steve Rogers in his civilian costume seen after the stealth mission in the beginning of the film. 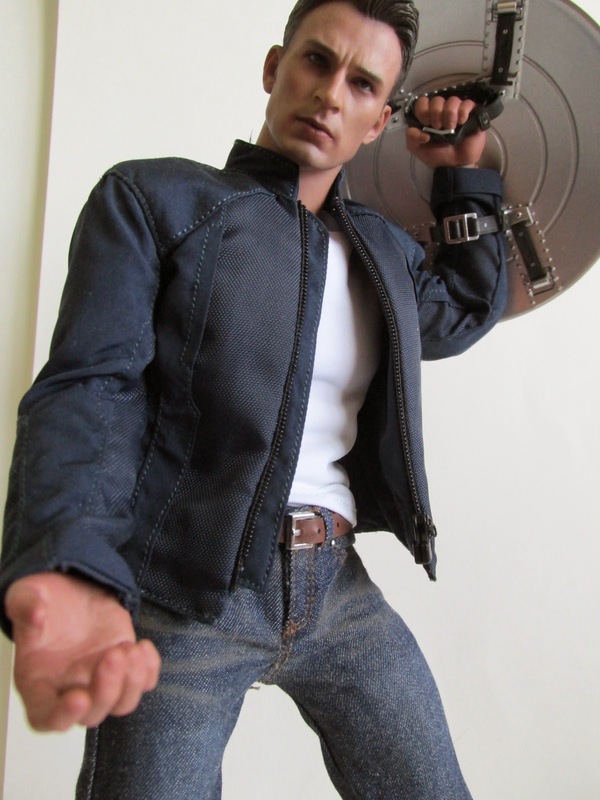 The costume looks great, and I love the worn details on his jeans. Articulation wise, he is a huge improvement over the Strike suit and can freely move in any way. 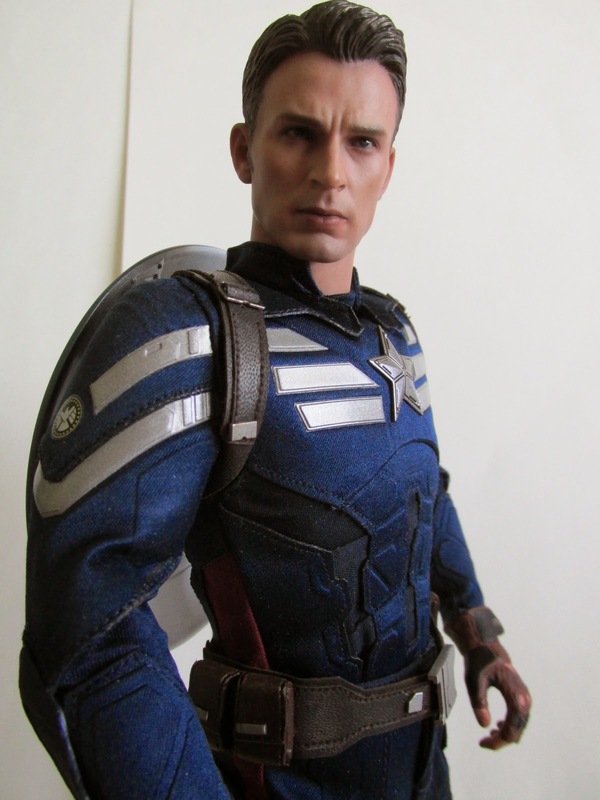 As usual the head sculpts for both figures looks great, and Hot Toys really nailed the likeness of Chris Evans. 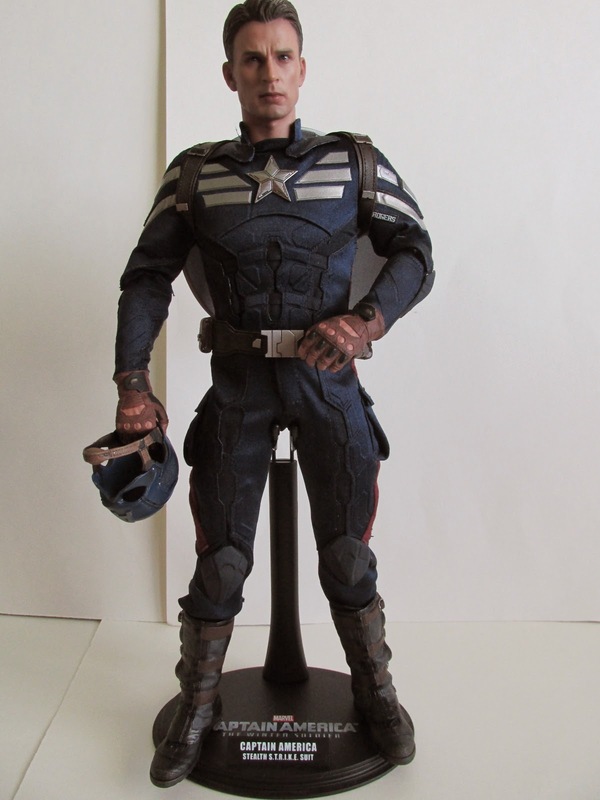 Of course the best part of both figures is that the two heads can switch bodies so it is now possible to have an unmasked Captain America figure. This unmasked look is one of the better looks of the two figures and just looks right overall. The one downside to changing heads is that the neck part of the shirts tends to get stuck under the neck. A small tooth pick like tool we have seen from the Iron Man releases is included to help alleviate this problem, but its still quite a challenge to get the clothes out. Accessories wise they come with lots of hands, a blue stealth shield, an extremely battle damaged shield, one handcuff, an empty cowl, and two base and stands. 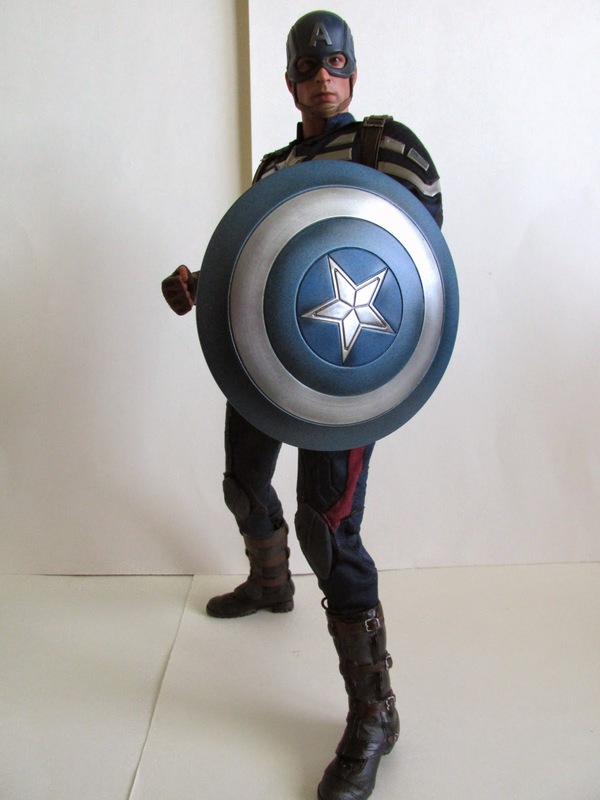 The die cast shields are a huge improvement to the plastic ones and just feel more durable. 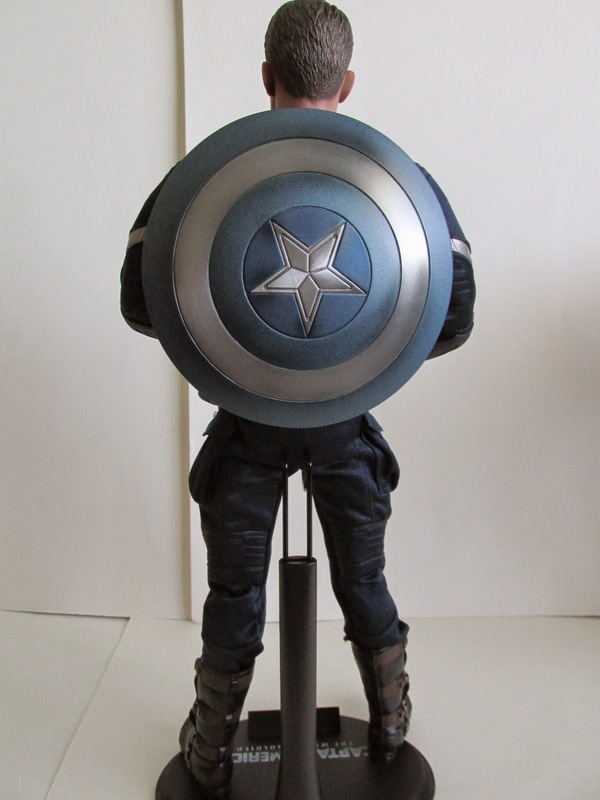 The battle damaged shield was not seen in the movie but was only seen on the teaser posters. 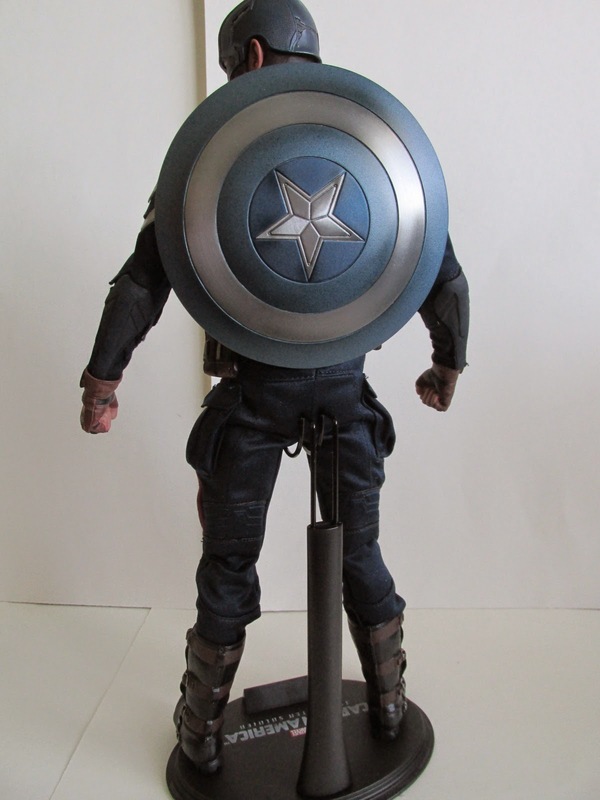 Still, the shield looks great and another great look for your Captain America figures. 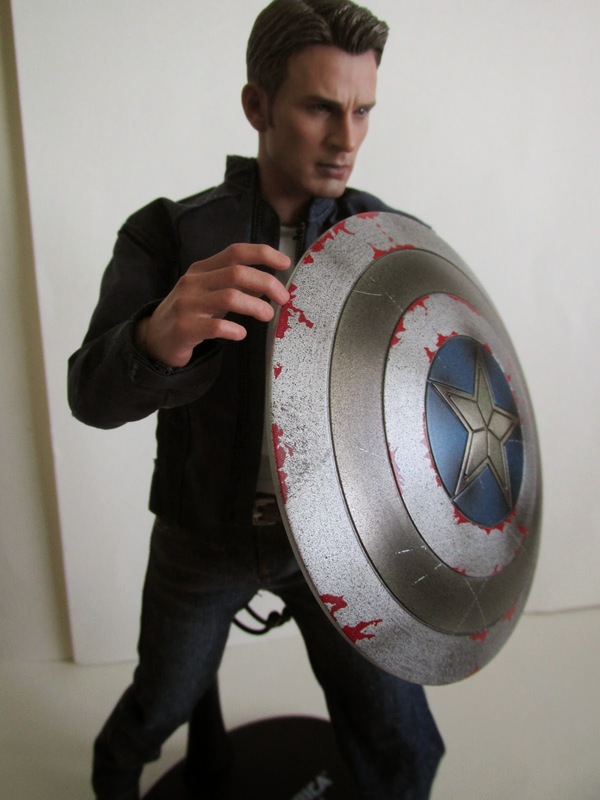 If you were wondering, the Avengers Captain America Steve Rogers head sculpt does not fit on any of these figures. 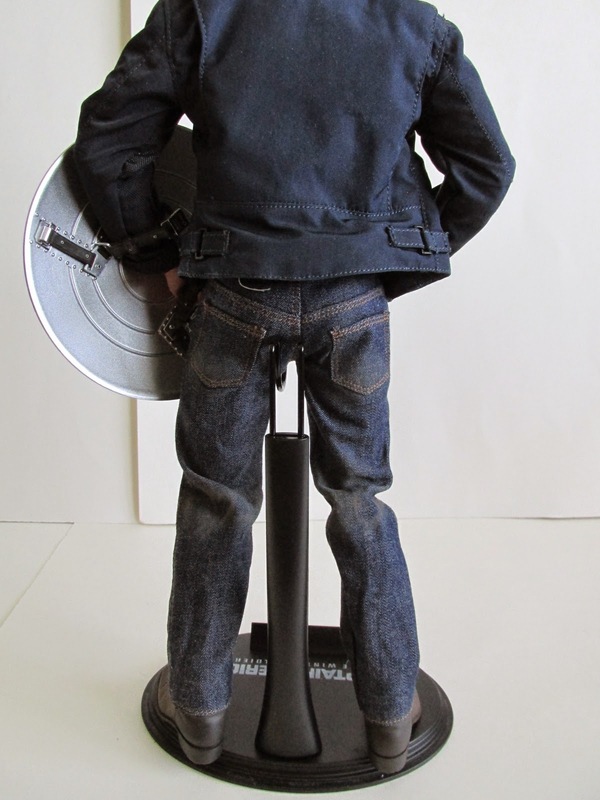 The neck and ball joint are different, but you can have the head sit on the figure…it just won’t stay though. 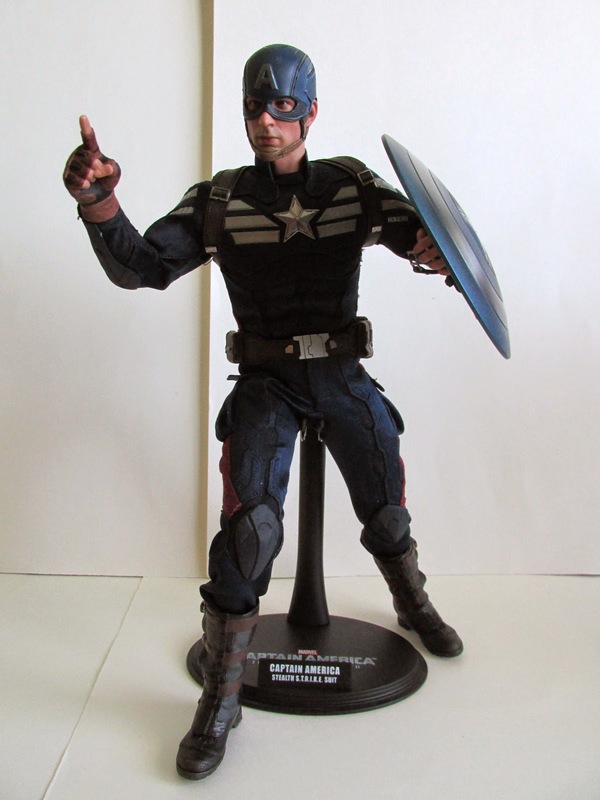 The Golden Age Captain America figure also will not work with any of these head sculpts. 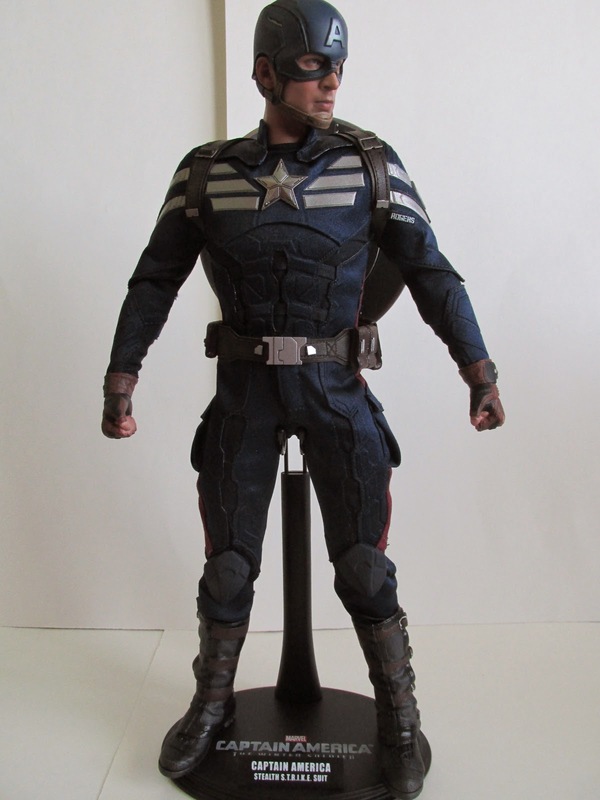 Overall, I do like these figures, but lets hope Hot Toys can get the articulation down for the Age of Ultron Captain America. 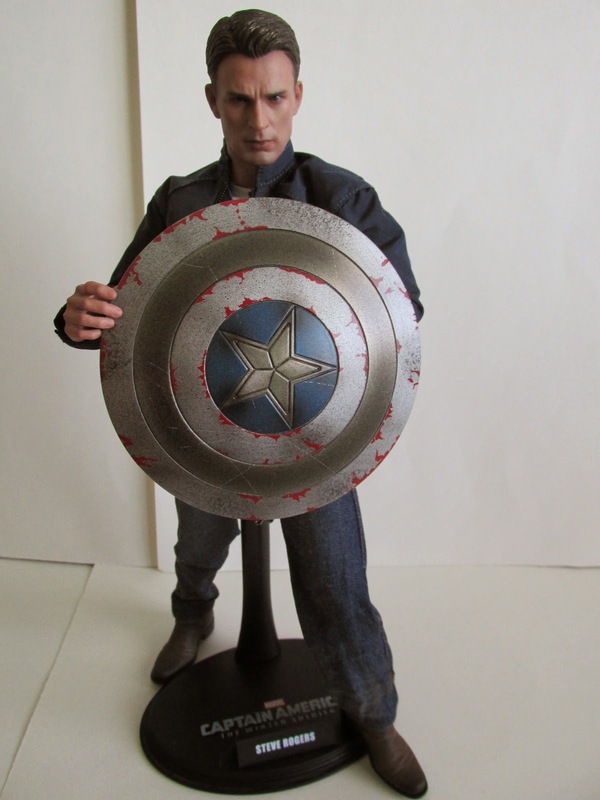 You can still get this set at Sideshow Collectibles here! or you can get the Strike Stealth Suit only version here!